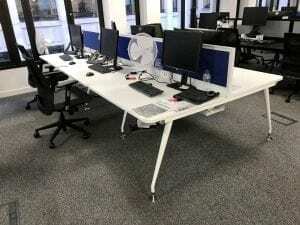 These white 1400mm bench desks are a versatile bench system that enables you to maximize your available space and simultaneously encourage collaborative work. Screens and integrated cable management trays are included. If you are interested in buying these desks or would like any further information, please contact one of our sales team on 07944 508282. Or, just click on the Telephone Icon located at the bottom of this page. 1400 x 800mm white tops.